Docker is a popular containerization tool used to provide software application with a filesystem that contains the whole lot they need to run. Using Docker containers ensures that the application will behave the equal manner, regardless of where it is being deployed, because its run-time environment is ruthlessly consistent. Docker containers are ephemeral, running just as long as it takes for the command issued in the container to complete. Sometimes, however, applications need to share access to data or persist data after a container is deleted. Databases, user-generated content for a web site and log files are just a few examples of data that is impractical or impossible to include in a Docker image but which applications need to access. Persistent access to data is provided with Docker Volumes. In this article we'll walk you through the steps to learn how to share data between docker containers. Note: Even though the Prerequisites give instructions for installing Docker on Ubuntu 16.04, the docker commands for Docker data volumes in this article should work on other operating systems as long as Docker is installed and the sudo user has been added to the docker group. Docker Volumes can be created and attached in the same command that creates a container, or they can be created independent of any containers and then attached later. 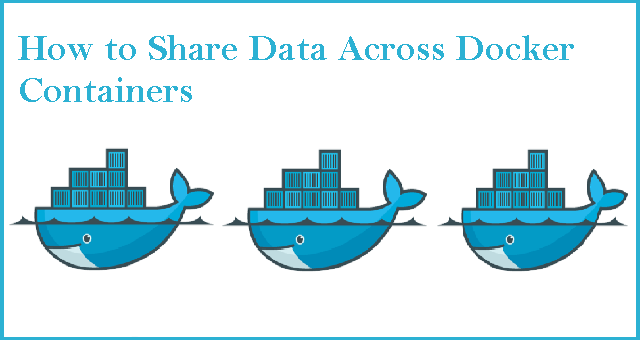 In this article, we'll look at four different ways to share data between containers. The name is displayed, indicating that the command was successful. To make use of the volume, we'll create a new container from the Ubuntu image, using the --rm flag to automatically delete it when we exit. We'll use -v to mount the new volume. -v requires the name of the volume, a colon, then the absolute path to where the volume should appear inside the container. If the directories in the path don't exist as part of the image, they'll be created when the command runs. If they do exist, the mounted volume will hide the existing content. Because we used the --rm flag, our container will be automatically deleted when we exit. Our volume, however, will still be accessible. Note: We can even look at the data on the host at the path listed as the Mountpoint. We should avoid altering it, however, as it can cause data corruption if applications or containers are unaware of changes. In this example, we created a volume, attached it to a container, and verified its persistence. In our next example, we'll create a volume at the same time as the container, delete the container, then attach the volume to a new container. We'll use -v to create a new volume. We'll name it DataVolume2. We'll use a colon to separate this name from the path where the volume should be mounted in the container. Finally, we will specify the base Ubuntu image and rely on the default command in the Ubuntu base image's Docker file, bash, to drop us into a shell. When we restart it, the volume will mount automatically. Finally, let's exit and clean up. And we can use docker volume rm to remove it. In this example, we created an empty data volume at the same time that we created a container. In our next example, we'll explore what happens when we create a volume with a container directory that already contains data. Generally, creating a volume independently with docker volume create and creating one while creating a container are equivalent, with one exception. If we create a volume at the same time as we create a container and we provide the path to a directory that contains data in the base image, that data will be copied into the volume. It's unlikely that we would want to mount /var/ in this way, but this can be helpful if we've crafted our own image and want an easy way to preserve data. In our next example, we'll demonstrate how a volume can be shared between multiple containers. So far, we've attached a volume to one container at a time. But often, we'll want multiple containers to attach to the same data volume. This is relatively straightforward to accomplish, but there's one critical caveat: at this time, Docker doesn't handle file locking. If you need multiple containers writing to the volume, the applications running in those containers must be designed to write to shared data stores in order to prevent data corruption. Use docker run to create a new container named Container4 with a data volume attached. Then, we'll exit the container. Next, we'll check that our data is still present to Container4. Again, Docker doesn't handle any file locking, so applications must account for the file locking themselves. It is possible to mount a Docker volume as read-only to ensure that data corruption won't happen by accident when a container requires read-only access by adding :ro. Let's look at how this works. In this example, we've shown how to share data between two containers using a data volume and how to mount a data volume as read-only. In this guide, we've created a data volume which allowed data to persist through the deletion of a container. We've shared data volumes between containers, with the caveat that applications will need to be designed to handle the file locking to prevent data corruption. Finally, we've shown how to mount a shared volume in read-only mode.